You might think that now that my kids have been back in school for almost two weeks, that I might have found some time to finally post pictures from my latest trip to the ballpark, way back on August 26th. Sadly, you would be mistaken. Inevitably, each day managed to have something else crop up. So, finally, here is my photographic coverage of that game against the Marlins. The Phillies lost, 6-5, so I won’t go into a whole game recap. That sort of thing is available elsewhere, if you’re so inclined to read it. 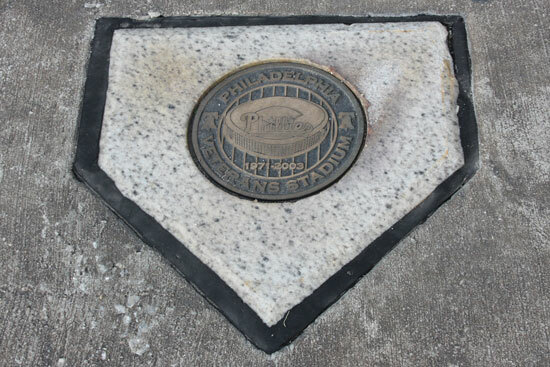 I'd always known that there was a marker commemorating the location of Veterans Stadium's home plate somewhere in the parking lot of Citizens Bank Park, but had never actually seen it. Now I know why - it's in the middle of a traffic lane, and sort of looks like a utility cover from a distance. 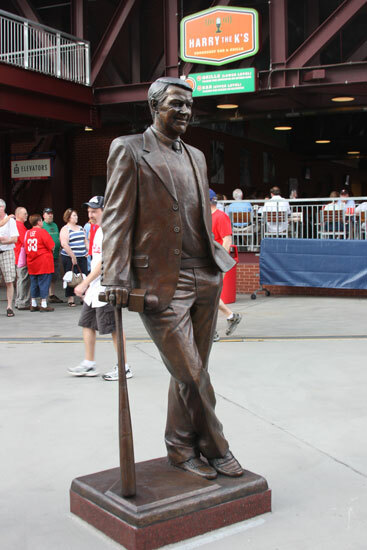 Unveiled just 10 days prior, this statue of the late Harry Kalas stands on the concourse just outside Harry the K's restaurant. It is amazingly detailed, right down to the "P" on Harry's World Series ring. "Hey Dave, does this boa make me look fat?" Even if it does, who would actually want to say so to the 6'8", 240 lb Michael Schwimer? Chase Utley leaps for the high throw as Emilio Bonifacio promptly steals second after singling to lead off the first inning. He ended up scoring the first run of the night for the Marlins, although it was unearned due to a throwing error by Wilson Valdez. Hope sprang up briefly, and Valdez redeemed himself slightly, when he hit a solo homer in the third to tie the score at 1-1. The Marlins scored again in the fourth, and from that point the Phillies trailed the rest of the game. Roy Oswalt had a rough night on the mound, giving up 6 runs (5 earned) in 5.2 innings of work. Four of those runs came on a John Buck grand slam, after the Marlins loaded the bases with three straight singles to start the top of the 6th. ...just before making the catch, he appears to be running into The Mist (or The Fog, depending on your horror movie preferences). In reality, the person seated in front of me had decided to stand up at that exact moment. Not wanting to be left out of the action, this vendor stepped into my viewfinder just as Carlos Ruiz puts the ball in play. It was one of those kind of nights. 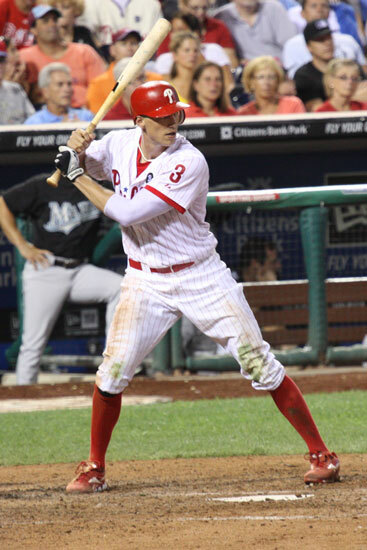 I'm really liking the style of newest Phillie Hunter Pence. He chokes up on the bat! He wears his socks high! He gets nice and dirty! 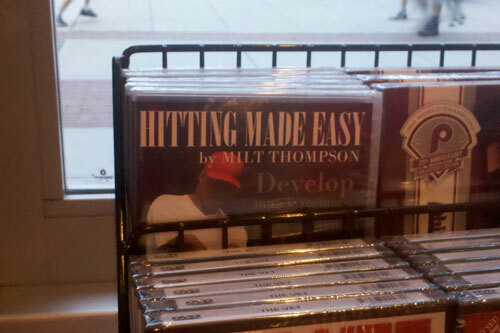 He got two hits! Michael Stutes displays the dreaded Inverted W. The jury is still out on whether it is truly "dreaded". Go ahead, Google it and see - some people think it is a harbinger of injuries to come, others think it makes no difference. Let's just check back on Stutes in a few years and see. 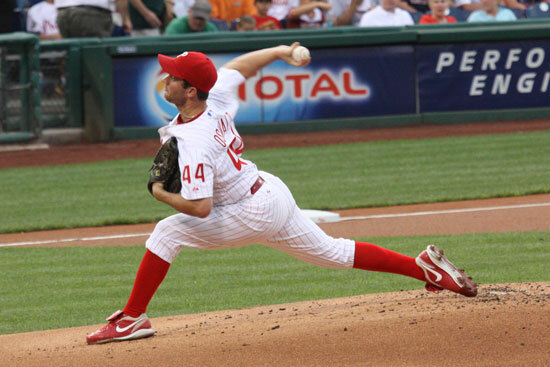 What the heck is Cliff Lee doing? I don't really know, and it appears neither does Gaby Sanchez. Lee was inserted as a pinch runner for Raul Ibanez in the bottom of the ninth. 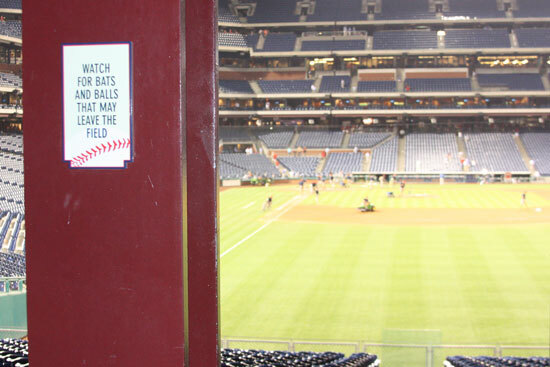 While waiting for the hubby to make a pit-stop after the game, I noticed this little warning at the back of the right field seats. Balls? Well, maybe. But bats? I don't think so. Last week, I was counting the days with anticipation until I would finally get to my first Actual Phillies game this season. We’d managed to get four tickets, so the whole family could go. The seats were really good, so I was looking forward to taking lots of amazing game action photos (well, in my mind they’re amazing; in reality, not always so much). And it was the 4 pm FOX game, so I wouldn’t have to worry about the kids getting tired and cranky. Mother Nature did not cooperate. On our way to the game, the skies were looking very threatening, so I decided not to take the camera after all. Rain and expensive photo equipment don’t really get along with each other very well. As a result, I have precious little visual proof of being there to share with you, other than a few shots from my cell phone. On the other hand, this would afford me the opportunity to actually see the whole field with both eyes! I can’t remember the last time I actually did that. Usually I end up missing at least a few great plays, because I’m looking through the camera and happen to be focused on the wrong player – unfortunately, an unavoidable aspect of sports photography. If you wait to see where the play develops, you will inevitably miss the play by the time you aim your camera at it. So, many times it is pure luck that you happen to be aimed at the right player. 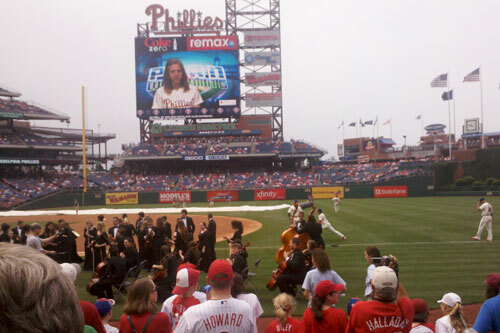 It turned out to be the Council Rock South high school orchestra, who were preparing to perform the national anthem. Note the gray skies, and the tarp still visible in the background. the clouds opened up and it started to rain. Not just rain – it poured. Big, fat, cold raindrops. We attempted to make our way as quickly as possible to the covered concourse, along with hundreds of other people who were between us and the shelter. This would have to be the only possible negative to sitting close to the field – it takes a lot longer to get out of the rain! Nonetheless, I’ll put up with getting a little wetter in order to be better able to see the action. Once under cover, my daughter announced that she wanted to go home right now. You know that wasn’t happening. My son, the voice of doom, wanted to know why we should wait around when the game would end up getting cancelled. Hah! Thankfully, the delay ended up being relatively short, only about half an hour. The rest of the afternoon was dry (though my clothes were not), and I actually got to see (with both eyes!) some great defensive plays by both first basemen (Ryan Howard and Carlos Pena), a not-so-great defensive play by Cubs second baseman Darwin Barney (who dropped a soft liner off the bat of Jimmy Rollins for an error), a dominating performance from Cliff Lee, and Chase Utley’s two-run double AND two-run homer! 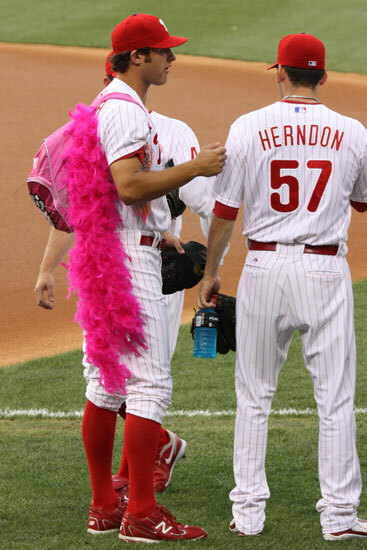 The Phils won 7-1, in relatively stress-free fashion. After all, the Phillies fired Milt Thompson as hitting coach in the middle of last season, replacing him with Greg Gross. Presumably, he was not doing a good enough job of making hitting easy for the Phils’ offense. I’ll get a second crack at shooting the Phillies (photographically speaking) in less than two weeks, when the hubby and I go sans kids to see the Phillies host the A’s in an interleague matchup. No rain, please! The Phillies closed out their Grapefruit League play today with a 7-6 win over the Astros, and will now head north to prepare for Friday’s season opener against those same Astros. In addition to leaving behind sun and warmth (both of which seem to be in short supply around these parts), let’s hope they also leave behind the proverbial injury bug. The Phils’ spring clubhouse seems to have suffered a heavy infestation – Domonic Brown is out following surgery on a broken bone in his hand; Chase Utley was sidelined the entire spring with a creaky knee, with no timetable for his return to action; and Brad Lidge is likely to go on the DL with pain in his shoulder. Additionally, Jose Contreras missed a couple days with a scratched cornea, Placido Polanco hyperextended his elbow, and Shane Victorino and Roy Oswalt luckily avoided serious injury after running into Raul Ibanez, and being hit in the back of the neck with a line drive, respectively. Enough already! Be gone, damn bug! But “bug” is a vague word. 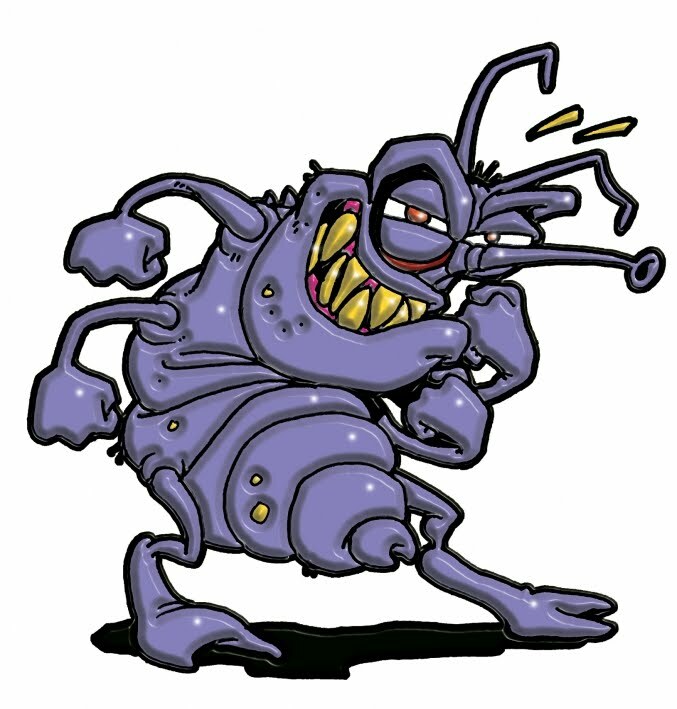 Is the injury bug an insect-bug? Do we need to call in an exterminator? At the moment, I don’t care which it is, I just want this team healthy! Right now! Just a couple of posts ago, at the start of Spring Training, I was, well, calm about the state of the Phillies. Of course, then I was blissfully ignorant of events that would transpire, and conspire to make me potentially lose my calm. 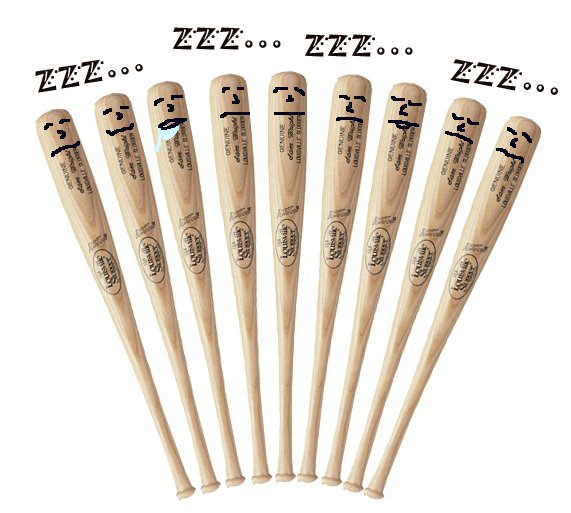 Then, Chase Utley was taking it easy because of some vague reports of “soreness”. Now, Utley has been diagnosed with patellar tendinitis in his right knee, has received a cortisone shot in said knee, and has yet to appear in a Spring Training game. Then, Domonic Brown was simply looking for his first hit of Spring Training. Now, although Brown finally got a hit over the past weekend, he broke a bone in his right hand in the process, something called the hook of the hamate bone. A tiny bone, to be sure. Surgery was performed this morning to remove the bone, and the expected recovery time is 4-6 weeks. I don’t even want to get into the fact that yesterday, the offense appeared to still be trying to awaken from winter hibernation, and Roy Oswalt allowed two home runs in 2 2/3 innings of work. Yes, I know, it’s still early, sometimes pitchers are “working on things” and “getting their work in”, and hitters are still trying to get their timing down and working out the kinks, yada, yada. So I will take a deep breath, and try to remain calm. For the final installment (for now) of “Not Who You Think It Is”, did you know that the Phillies have had not one, but two legends of rock on their roster? Well, not really, just in name only. Phil Collins the rock star rose to fame first as the drummer for Genesis, followed by a very successful solo career. But being British, he likely never played baseball. Phil Collins the ballplayer pitched for the Phillies from 1929-1935. The Phils of this span were mediocre at best, just scraping above .500 once (78-76 in 1932), and really stinky at their worst (52-102 in 1930). Collins himself was 72-79 with a 4.67 ERA during his stint with the Phils. Jim Morrison the rock star was the frontman for The Doors from their inception in 1965, through 1971, when he died of a supposed drug overdose in Paris. There are some who believe that Morrison never actually died, and that he faked his death. Jim Morrison the ballplayer debuted with the Phillies in 1977, and during his two seasons in Philadelphia compiled a .174 batting average while appearing in 58 games. In 1979, he went to the White Sox as the “player to be named later” in a deal that brought the Phillies Jack Kucek. Jim Morrison the ballplayer was last spotted managing the Charlotte Stone Crabs, a minor-league affiliate of the Rays. Jim Morrison the rock star was last spotted with Elvis, buying Slurpees at a 7-Eleven in rural Georgia. In my first installment of “Not Who You Think It Is”, I apparently jumped the gun a bit when I mentioned there were no Phillies injuries to worry about (yet). Note I did use that disclaimer “yet”. Because now it appears that Chase Utley has been hampered so far this spring by what has been diagnosed as patellar tendinitis. Patellar tendinitis is also known as “jumper’s knee”, which begs the question as to what Chase has been doing this offseason, hmm? Turns out it can be caused by many activities that don’t involve jumping, so I guess we can stop wondering what Chase was spending all his time jumping over, or on. So to distract my thoughts from Chase’s knee, let’s get on with the next entry in the possible mistaken identity sweepstakes, Buster Brown. If you’re of a certain generation, the first thought that pops into your head when you hear the name “Buster Brown” is probably a pair of shoes you had (or wish you had) as a child. But just like Ethan Allen, there was no Buster Brown heading up Buster Brown shoes. There was, though, a George Brown, who started the Brown Shoe Company in 1878. 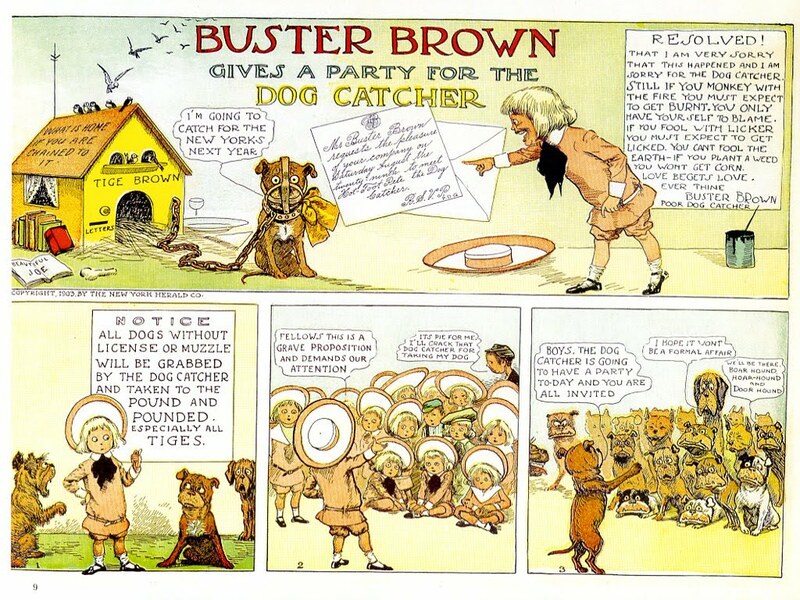 In 1904, the Brown Shoe Company purchased the rights to the name Buster Brown, which was a popular comic strip that had debuted in 1902. Blues fans may remember a different Buster Brown, who cracked the pop Top 40 and hit #1 on the Billboard R&B charts in 1960 with his song “Fannie Mae”, presumably not about affordable housing. Finally, we have Buster Brown the baseball player. A major league pitcher from 1905 to 1913, he appeared in 31 games for the Phillies from 1907 to 1909, compiling a 9-6 record with a 2.56 ERA. His career totals would be less than stellar at 51-103, which would probably be why we think of shoes first, and not him. Next time, rock icons that played for the Phillies? After the Giants beat the Braves last night, the Phillies now know who their opponent will be in the NLCS, which doesn’t start until Saturday. Granted, the Phillies made quick work of the Reds, sweeping them in three games; the Giants needed four games to dispatch the Braves. 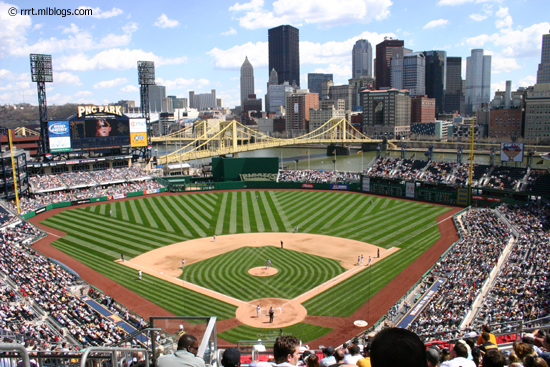 Even if both series had gone a full five games, the divisional series would have ended on Wednesday. Why do we possibly need two full days off between series??? Initially, I thought I wanted the Braves to advance, because I felt the Phillies had a better chance against their pitching. On the other hand, those two teams had already met 18 times during the regular season (with the Phils winning 10), so there was a certain amount of familiarity. The Giants and Phillies have only played each other 6 times, which I’m sure has it’s own set of pros and cons. At least now I won’t have to hear that annoying (and some would say politically incorrect) Braves chant during the games, and as far as I know, the Giants don’t have any sort of mass chanting from their fans. Flip side is, I’ll have to watch Tim Lincecum and his girlie hair. Since my last post, following Roy Halladay’s no-no, the Phils took the next two from the Reds, though in rather opposite ways. In Game 2, the other Roy wasn’t quite so sharp, and in fact, Oswalt later admitted that he had felt a bit rusty. The Reds took advantage and jumped out to a 4-0 lead after 4 1/2 innings. But then the Phillies started to chip away at the lead, and the Reds let the game slip through their fingers. Literally. The Reds committed four errors in this game, and their pitchers hit three batters (more on that in a bit). 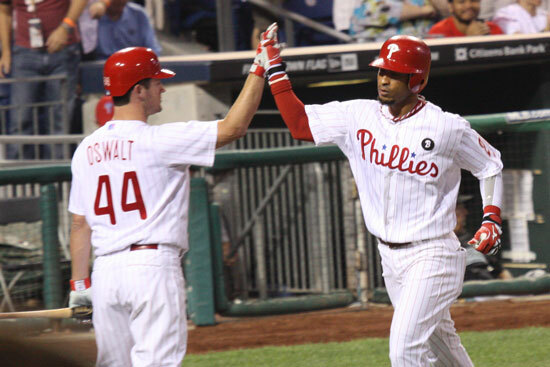 Bottom line, Phillies won 7-4, though only two of the runs were earned. Game 3 was a much more polished affair, as Cole Hamels went the distance for a complete-game shutout as the Phils won, 2-0. For the Phillies Phaithful, it was only fitting that the final out was a Scott Rolen strikeout. Lemon Face had an atrocious series, going 1 for 11 with eight strikeouts! He also committed two errors! Hee hee! You may recall Rolen’s demands to be traded near the end of his tenure with the Phils, saying that the Phillies management and ownership weren’t committed to winning. Looks like the Phils have been doing pretty good lately, doesn’t it, Scott? Chase Utley, for his starring role last Friday in “Chase’s Excellent Adventure Around the Bases”. First, Utley was (maybe) hit on the hand by Aroldis Chapman; next, he (maybe) was safe on a close play at second; and finally, he (maybe) touched the base while rounding third. He was definitely safe at home. John Mayberry, Jr. may have been surprised to learn that he was also hit by a pitch in that game, because he is not on the postseason roster! I’ve often wondered if the sportswriters actually watch the games. It would seem the answer is no, because if they did they would know that it was Ben Francisco who was nearly decapitated when the ball went off the brim of his helmet. Listening to the TBS announcing duo of Brian Anderson and Joe Simpson was enough to make me catatonic, given that they collectively seem to have as much personality as my pinky toe. And they clearly need some lessons in enunciation – one of them (I’m not sure which, they’re both equally dull) kept saying “Utley” in a way that made it sound like “Ugly”. Hubby, son and I were in hysterics. This team is definitely loose and having fun!